There are several types of RVs available for different travelers. One of the earliest forms of RVing and still popular today: The camper. The camper is lightweight and inexpensive, but that doesn’t mean they don’t come feature rich. Campers can make or break an RV trip because they’re small and you need every inch of space available to make it work. Here are five of the best campers on the market and why you should consider each one. If you like camping and A-frame styled anything you’re going to love the Aliner: An A-Frame-style pop-up camper that does things differently. One of the first things that jump out about the Aliner is its compact size and low weight. The standard Aliner Classic checks in at over one ton meaning you don’t have to have a big truck to haul it, heck you don’t even need a truck as the Aliner can be pulled with many different standard sized cars, including station wagons, minivans, and SUVs. You get a lot of punch in that size though as even the standard options on the Aliner will work for most RVers. The Aliner comes with electric brakes and even a breakaway switch to give you confidence taking the Aliner through any terrain. Front and rear diamond plates protect the underbelly from rough terrain and debris. Four stabilizer jacks make sure you get a level site every time. A two-burner stove, 3-cubic foot refrigerator, and sink let you cook on the go and two skylights let in plenty of lights from outside. There are several extra options you can choose for the Aliner, but the camper itself is loaded. Rockwood is a great series of pop-up and hard side campers made by the popular Forest River Inc. There are several versions of the Rockwood series including the Freedom, Premier, High Wall pop up camper styles and the Hard Side series, a hard side camper. The Rockwood is affordable for many families, but that doesn’t mean it doesn’t have its share of features and goodies. Standard exterior and hardware features on the Rockwood include 15” Mud Rover radial tires, built in mounts for an ​Equal-i-zer hitch, diamond plate front cap and a bevy of storage options. The interior brings out the best in the Rockwood Series. The mattress is quilted top and on many versions of the Rockwood, a heated mattress is optional so you can stay warm in cold weather. The kitchen comes with a residential double sink, family style dinette, jumbo icebox, and a free-standing double burner range. The options on the Rockwood vary with the model you choose, but many of the standard features of the Rockwood are fantastic options for most families. Campers don’t always mean pop-ups and the Fleet Flat Bed Truck Camper by Four Wheel Pop-Up Campers prove this. As the name implies the Fleet is designed as a semi-permanent truck camper that locks into your truck’s bed area. This little pop-up truck camper can sleep three to four people in a pinch with its queen mattress and ​a conversion sleeper sofa but that’s not all the Fleet has to offer. Popular standard features on the Fleet include tough insulation of the walls and roofs of the camper, a vinyl side liner, one-piece roof and an aluminum body that will bend with tough roads but not break. The kitchenette includes a pump sink supplied by a 20-gallon freshwater tank, two burner propane range, and a dinette with swivel table. Other great amenities on the Fleet include LED interior and exterior lights, room for two standard ten-pound propane tanks, finished wood interior, and the whole thing comes pre-wired for solar if you want to get off the grid. The popularity of truck campers may have died off a bit in recent years but if you want a solid flatbed camper that can endure anything your truck can at a good price, go with the Four-Wheel Fleet Flat Bed. 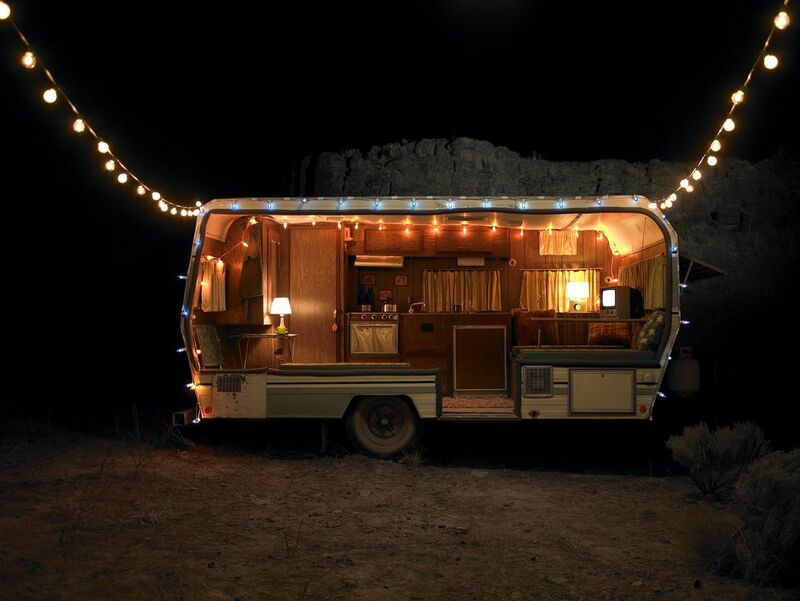 Teardrop campers were one of the earliest styles of campers when RVing became popular in the mid-20th century. The Little Guy Teardrop Camper takes the traditional teardrop design to a whole new level. One of the primary advantages of the Little Guy is the primary advantage of most teardrops: The compact size and its light-weight frame. Even the larger models of the Little Guy can be towed with a small SUV and some smaller models can even be hauled with standard sized cars. This light footprint means the Little Guy is not only friendly to the tow vehicle but also friendly at the pump. Little Guys come in four, five and six-foot wide models. The six-foot model can even fit a king-sized mattress so you can sprawl out after a long day on the trail or road. The interior space of the six-foot model contains not only that king-sized mattress but also 12v/110 electrical inputs and interior storage. The kitchen (or galley) is found on the rear part of the Little Guy. Open the hatch to find a sink and two burner range along with ice box storage, cabinet storage, and electrical outputs. The Little Guy may be little, but the size and features make for a perfect camper for singles or couples that don’t demand too much of their camper except for a place to sleep, eat, and see the land. The Sylvan Sport GO Pop-Up camper may be a lot of things, but quiet is not one of them Sylvan Sport advertises the GO as the best pop-up camper ever and while there is no way to prove this, it is sure one hell of a pop-up. The first thing that strikes about the GO is its versatility while the camper itself weighs only 840 pounds it can haul up to ten kayaks or bikes! That’s right, even a Toyota Prius could haul the GO outfitted with plenty of outdoor equipment including boats, bikes, dirt bikes and even an ATV. If it weighs less than 800 pounds, the GO can tow it. Here’s the kicker, though, the GO is not for those that crave constant creature comforts. There is no sink, no electrical hookups, no TV, or anything of that nature. The Sylvan GO would be classified as more of a pop-up tent camper but it is a camper nonetheless and it comes loaded with its size. The GO comes with several great features including a waterproof pop up tent, self-inflating air mattress, stargazer panels, LED lighting, zippered entry, and screen door and more. The GO is tough with a tig-welded frame, 13" ground clearance, diamond-plate brush guard, even the frame is designed to not put any stress on the tow vehicle. If you’re looking for a small upgrade from traditional tent camping, then the SylvanSport Go Camper may be right for you.